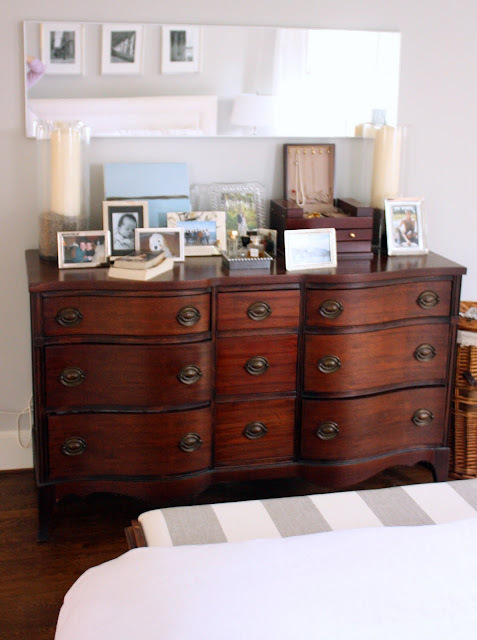 I inherited a cedar chest from my grandmother and wanted to incorporate it into our master bedroom for much needed storage and seating. And while I appreciate pieces with history, the fabric just didn't fit our aesthetic. 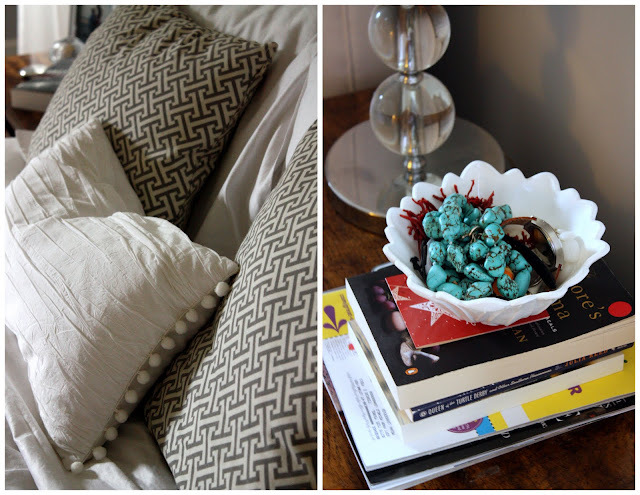 So this weekend, after a trip to Mary Jo's, I used a yard of fabric to upcycle my family heirloom. And because it is fun to look back and see where we came from to appreciate the progress made, this is a picture from shortly after we moved in. And this is a similar shot of the room now. And a display of loved ones with my DIY lavender hurricanes. I still think there is a way to go in this space. I'd like to add some trim to the curtains, perhaps swap out the lampshades, add a floral pillow, reupholster the vintage chair in the corner and paint an abstract for the far wall. Stay tuned! Just when I think I have uncovered every on-line source for trim/fabric...another one! Yeah! The after is so light and bright and beautiful, well done. Love the room and those long curtains are the best! If it weren't for some furry dogs I too would have those in my master bedroom. I'm so jealous of that space you have. Our room is seriously the size of a box. How we managed to fit our bed and dresser in the same room is still beyond me. this looks so fantastic! I remember hearing once that the room you should always do first is YOUR room...b/c that is where your space and you spend a lot of time in it! So when I moved I did our room first...and I am so glad I did! 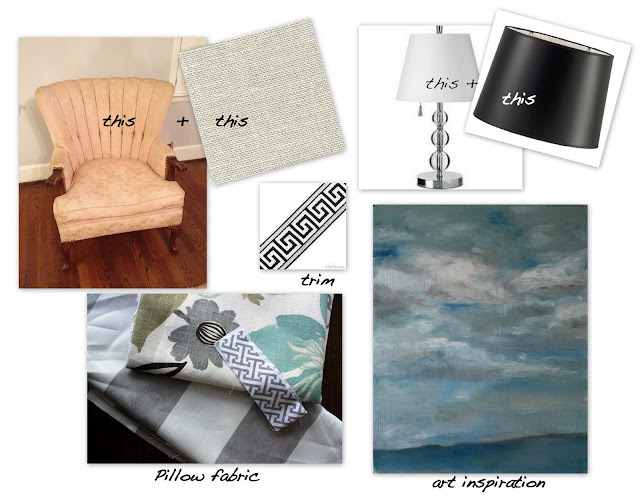 I love the fabrics and colors you chose...very soothing! 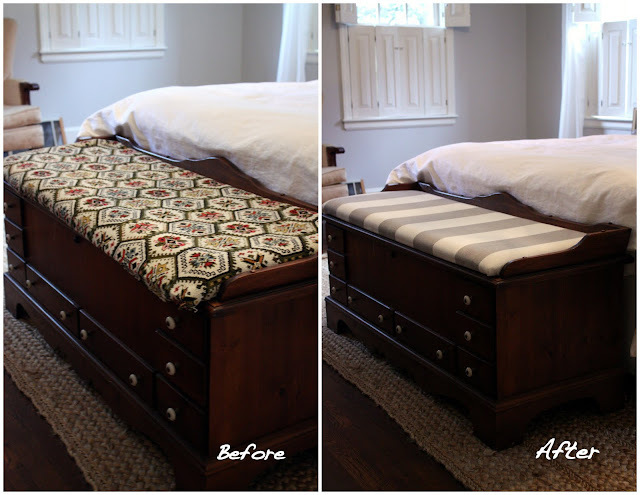 Your bedroom looks beautiful and what a great way to reinvent your grandmothers chest. I LOVE that gray and white stripe fabric so much. Excellent work! That room is beautiful! It is so bright and open. I'm new to your blog and just love your attention to detail in all you do! Also love the photos of Major! Omg, it is beautiful! So calm and serene. Exactly the way a master bedroom should look! 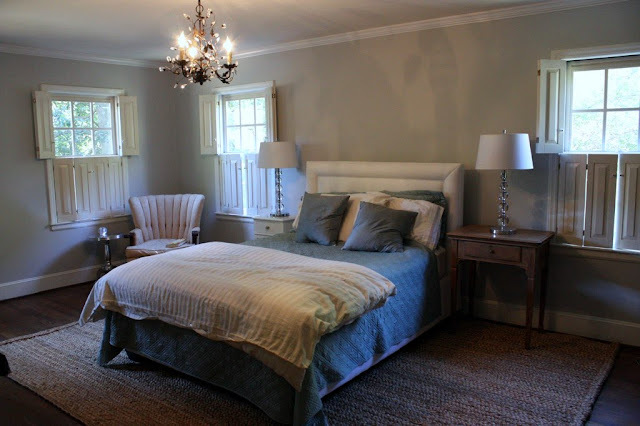 The bedroom looks great- the bench at the end is perfect! What is the paint color on your walls? I love it!